XERT the Xpeditr Emergency Response Team has tried, tested, approved and recommends the newest power solution on the market - the CarGenerator. Transportation and wine storage experts, Xpeditr Inc. understands wine at a molecular level, and the necessity for a stable environment to ensure optimal conditions for aging. Even the smallest changes in the elements; temperature changes, humidity variances, friction and agitation can quickly damage a fine wine bottle, or entire collection. Many wine lovers and aficionados have at-home wine storage facilities, whether it’s a wine fridge or entire wine cellar, they take due care in regulating humidity and temperature levels, ensuring conditions are optimal for wines to mature and age gracefully. At a time when environmental factors have become more extreme, with strong winds and flooding risks in the summer, snow and ice storms in the winter, it is very important to have a plan in case of an emergency. XERT the Xpeditr Emergency Response Team knows the risks far too well. Since it’s inception the team has evacuated thousands of bottles from disaster zones across the country, rescuing millions in investments that would otherwise be lost to the elements. With their experience in emergency wine transportation, the XERT team emphasizes that one of the major problems during an emergency is power failure; they can be frequent, long-lasting, and quickly damage power reliant aspects of a home. A fine wine collection can take a lifetime to build, and just hours to destroy. Wine lovers and collectors are always on the hunt for a reliable off-grid power source that will provide an added level of protection during an emergency. Although there are off-grid power solutions available, if money and space are not a concern, the Xpeditr Emergency Response Team has tried, tested and approved the latest off-grid solution to make an impact on the market - the CarGenerator! The CarGenerator turns the family car into a generator, providing up to 1000W of clean electrical power to keep a home’s furnace on, refrigerator running, and wine cellar temperature and moisture controlled when the power goes out. The CarGenerator is lightweight (at 16 lbs) and portable, it can easily be stored in the trunk of a car or garage shelf, and works 100% of the time when connected to a working vehicle. CarGenerator is a great way to enjoy the benefits of owning a generator without the hassle of traditional portable generators, or the cost of larger whole-home units. Instead of a conventional gas-powered generator that comes with a hefty price tag, and requires regular maintenance and fresh gas to be reliable, the CarGenerator is a simple, lower-cost, more elegant solution that provides vital power when needed. 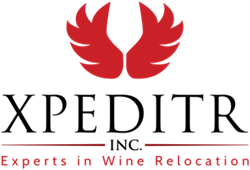 Founded in 2005, Xpeditr Inc. is renown in the industry for premium wine relocation services across USA and Canada, climate-controlled storage solutions, and the premiere choice for fine wine lovers across North America. Xpeditr employees are themselves fine wine collectors who not only understand the inherent importance of controlled conditions in the aging process, but also appreciate the bouquet, body and finish of a perfectly aged wine. Staffed with sommeliers, logistics, transportation and warehouse professionals, the Xpeditr team provides stress free, custom tailored solutions for all wine storage and transportation needs, and continues to develop new services to meet client needs including wine insurance policies, shipping alternatives, XERT, and My Private Sommelier Services.